Last month I had the opportunity to attend the opening of Delta’s Terminal 4 at JFK airport. There was a lot of anticipation and excitement for the opening of T4. The thing I was most excited for was the great food options the terminal would offer, especially Shake Shack. I wrote a post about this prior to the new terminal opening which was also featured on the Boarding Area blog Delta Points. When I arrived at T4, I had a couple of objectives in mind. As long as the lines weren’t long, I had to eat at Shake Shack and check out the new Sky Club/ Sky Deck. There will be two Shake Shack locations at T4 but it turned out that only one was open in time for the terminal’s opening. The second location should be opening very soon. After walking for quite a while through the terminal, we finally found Shake Shack. I was really looking forward to finding out what the location- specific Concrete flavors were. Luckily, when we arrived there was only one- two people on each line so we figured it was best to eat right away. I ordered the first Concrete flavor- “Fly Me to the Shack” and asked for a half size. Due to some technical issues with the cash register (they had no way to ring up a half concrete), I was given the regular size for the same price! Fly Me to the Shack sounded delicious and I did enjoy it but it had a bit too much going on. It was definitely a chocolate overload. I think if I had been given the smaller size or shared it, I would’ve enjoyed the Concrete a lot more. Burger Coupon or Plane Ticket? I also had to order a Shackburger. I got the burger for free thanks to a coupon (that looks like a plane ticket) which was given out at the T4X Closing Concert with Ed Sheeran that I attended the night before. I was impressed with the burger which wasn’t much of a surprise. However, I could have seen it being not as tasty as usual due to it being the first day for this location. Shake Shack had lots of management and trainers there to keep things moving smoothly. While waiting for my order we spotted Danny Meyer, the founder of Shake Shack. I went to say a quick hello and let him know that this was my third day in a row eating at a different Shake Shack location. We then took a photo (at the top of the post) and I went to pick up my food. The JFK Shake Shack also serves breakfast but it wasn’t available on opening day. 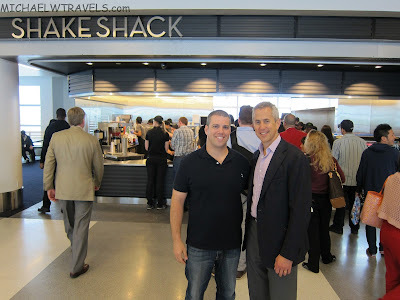 Shake Shack is a great addition to Delta’s Terminal 4. I’d love to see Shacks open in airports all over the country. This was definitely one of my favorite meals that I’ve ever had at the airport! Just can’t wait to spend some time in TX4! is shake shack pre security? is there any seating available? i am meeting 6 friends at the airport and would like to visit fora while. Shake Shack is by the gates, after security. There is a good amount of seating but if you aren’t flying, you most likely won’t be getting to eat there.